Fried Green Beans | Naturally. There are times in life when I sometimes crave something greasy even though I know fried food= bad. So, I have taken to baking some of my favorite fried foods like the onion ring or the cauliflower. But you know what? Sometimes that just doesn’t cut it. Sometimes I need the real thing. Golden brown and crispy on the outside with deliciousness on the inside. I was skeptical about fried green beans but so many places around here serve them. So, I breaded, breaded again, heated up some canola oil, and fried away. Set-up a breading station ( 1/2 flour, milk, and 1/2 panko.) I pulsed the panko, garlic powder, and oregano together in a food processor so that the panko was fine. Start by rolling the bean in flour, dip it in the milk, and roll it in the panko mixture. Place in a bowl. Once all the green beans are through, repeat so that each bean is double breaded. Heat oil to 350˚. Place green beans in oil without crowding. Let fry until breading is golden- 3 to 4 minutes. Remove with tongs and place on sheets of paper towels. Would also work to bake. get out of town! these are adorable. and the look absolutely delicious! i’m definitely making them for my next dinner party! soooo yum! thanks for the inspiration! Your welcome- these didn’t last long at all in my house! Yum! I love fried green beans. 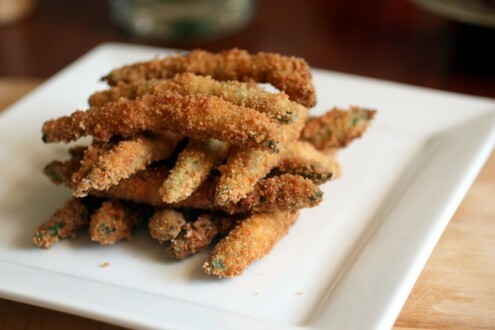 We actually call them green bean fries. Those beans look so delicious. If i baked them what temperature and how long would i keep them in the oven for? A type of bread crumb. any dipping sauce ideas that would pair great with this recipe? I’ve only ever done ranch or marinara! I mix up a horseradish ranch sauce. It’s excellent with the beans! I also have done a ranch and wasabi dip. I don’t measure, but just start with ranch and start adding wasabi to taste, depending how much zip you want! we just tried these and they came out great! thanks for the recipe! Panko is a japanese variety of bread crumb- you can find them in most grocery stores. A great dipping sauce is sour cream with cayenne. Stir enough cayenne into the sour cream until it gets yellow in color. Let sit several hours; the color enhances as it sits. These were fantastic! Thanks so much for sharing! That’s absolutely delicious! I made green beans for dinner and everybody loved them. Thanks a lot! I made these but used Everglades Seasonings, Pre-seasoned breader and baked in oven. AWESOME!